To say that Casares is beautiful is an understatement. Casares is a picture postcard village with a population of just three thousand and the view from the approach is definitely worth a photo. To say that Casares is beautiful is an understatement. Most of the white villages are beautiful but there is something very special about the sight of Casares that causes the visitor to park the car and simply stare or take a photo. There are the sugar cubes again, piled precariously high and just nudging the battlements of an Arab castle. It is hard to believe that this enchanting, typical village is only nine miles from the hustle and bustle of the coast and somehow succeeded in avoiding the coach tour circuit. It is best to approach the village for the first time when driving from the coast road (N340/A7) by turning inland at Km. 147 (between Estepona and Sabinillas) near Torre de la Sal and head inland for 15 km. The scenery is picturesque, so take your time or stop at Venta Garcia on the way. Suddenly you turn a bend in the road, and are treated to a spectacular view of the village with its medieval fortress on the top. This view is best in the afternoon sun. Park the car here, below the o called leather factory, of further on near one of the bars and climb down one of the steep but well maintained footpaths that lead into the village square called Plaza de España. From here explore the village by taking a stroll. Alternatively follow the road round the outskirts and on to the west side there is a visitors centre with car park and exercise swings form adults. From here you can climb up the path to the top of a hill for another white village view. This view is best in the afternoon sun. Hire a car is best way to get around! This is the only way to visit Casares since there is only a morning and evening bus a day to Estepona! (see timetable). Consult our general Car Hire page for the best deals in har hire in Andalucia. Private half day small group tour in Casares, visit birthplace of Blas Infante. Stroll along narrow streets until reaching up to the Moorish castle. Visit the old crafts museum. Discover where the Roman Hedionda baths are located. 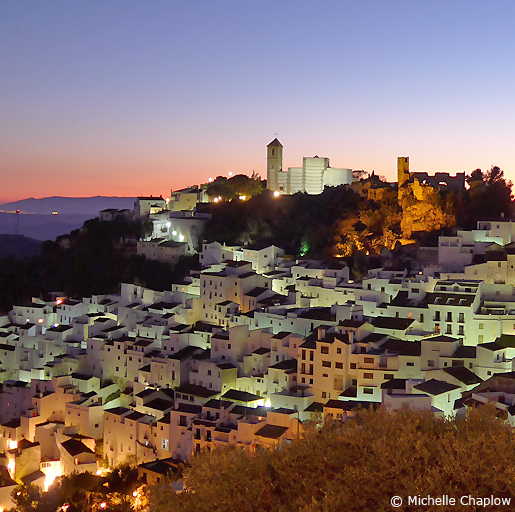 Casares is a pleasant white village to stroll around. Visit Blas Infante birthplace, Iglesia de San Sebastian, near the square or climb up via Puerta Calle Arrabal, to the Castle, ruined church, Iglesia de la Encarnación now Centro Cultural Blas Infante, old cemetry. There are also number of signed walks just outside the village. Further afield there are beaches such as the Playa de la Sal which allows dogs and are beautiful and well kept. There are also golf courses in Casares and neighbouring towns. In May the Pilgrimage of Virgin de Rosario del Campo. the image of the virgin is taken from the church of San Sebastian 11km to the hermatige of Rosario del Campo on the other side of the river Genal. Leave Casares on the road which winds around the village past the visitors centre and football pitch. When you get to the T junction you can either turn left for Manilva and the coast, or turn right for the next white village with a story; Gaucin. Read about the history of Casares in the article first published in Andalucia Magazine. Hover the cursor over Casares to see bigger map and click to go to the maps page.